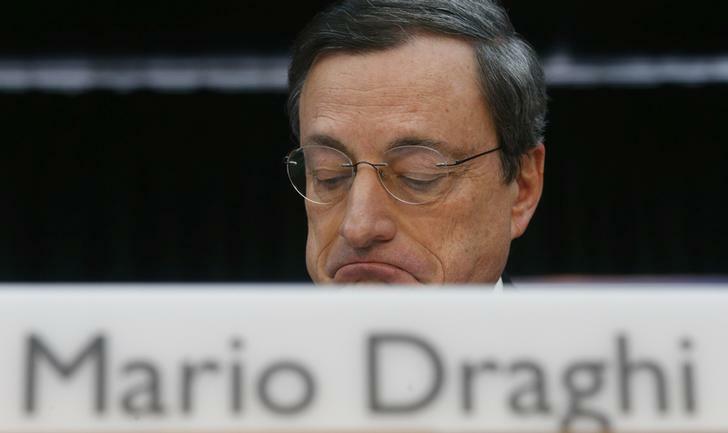 Mario Draghi is relaxed about the excitement in the bond market. The European Central Bank president simply says higher volatility is here to stay. His press conference comment helped stoke a sharp increase in euro zone sovereign bond yields on Wednesday. But he was only stating the obvious. These days, the real hazard for bond investors is being part of too big a herd. The latest bout of volatility actually started on Tuesday. In two days, the yield on 10-year German debt climbed 36 basis points, the biggest rise in that short a time since 1998. The rise for comparable Italian and Spanish yields was 24 and 20 basis points respectively. But bond volatility is hardly exclusive to the euro zone. On May 11, 10-year U.S. bonds rose by 13 basis points, almost two-thirds more than Italian or Spanish ones climbed that day. A positive euro zone inflation reading and the prospect of a rate increase from the U.S. Federal Reserve may perhaps explain some of the sharp movements. But such developments cannot justify the scale of moves in assets which used to be safe and stolid. The gyrations are mainly an inevitable consequence of herd behaviour. Too many investors ploughed too much money into such bonds for too long. Yields fell so low that investors had little or no cushion against losses. They became jittery and would try to bail out at even the tiniest provocation. But the groupthink has made the trade so crowded that the market is prone to stampedes – and far from tiny movements. Volatility breeds more volatility. Scarred by the brutal moves, investors are less and less willing to ride out each new setback, let alone to buy as prices fall. The herd becomes twitchier. And it’s not just psychology. The common investment strategy of trying to limit the chance of losses pushes up volatility. That’s because the way they keep this probability roughly constant is by selling when bond swings have become more amplified. In this environment, there is more danger than safety in numbers. European Central Bank (ECB) President Mario Draghi reacts at the monthly ECB news conference in Frankfurt March 6, 2014. Ten-year German bond yields rose by a total of 36.1 basis points on June 2 and 3, their biggest two-day increase since 1998. The European Central Bank sees no reason to adjust its monetary policy stance in response to a recent rise in bond yields in Europe, European Central Bank President Mario Draghi said on June 3. “We should get used to periods of higher volatility. At very low levels of interest rates asset prices tend to show higher volatility,” Draghi told a news conference after the ECB’s regular policy meeting.